HP Slate6 VoiceTab smartphone Android. Diumumkan Januari 2014. Fitur 3G, 6inch IPS kapasitif touchscreen, Quad-core 1.2GHz, kamera 5MP,Wi-Fi,GPS,Bluetooth. HP iPAQ h6310 Windows Mobile smartphone. Diperkenalkan pada 2004, 4Q. Hadir dengan fitur: layar 3.5inch TFT resistive touchscreen, Wi-Fi, Bluetooth. HP iPAQ h6315 Windows Mobile smartphone. Diperkenalkan pada 2004, 4Q. Hadir dengan fitur: layar 3.5inch TFT resistive touchscreen, VGA camera, Wi-Fi, Bluetooth. HP iPAQ h6320 Windows Mobile smartphone. Diperkenalkan pada 2004, 4Q. Hadir dengan fitur: layar 3.5inch TFT resistive touchscreen, Wi-Fi, Bluetooth. HP iPAQ h6325 Windows Mobile smartphone. Diperkenalkan pada 2004, 4Q. Hadir dengan fitur: layar 3.5inch TFT resistive touchscreen, VGA camera, Wi-Fi, Bluetooth. HP iPAQ hw6510 Windows Mobile smartphone. Diperkenalkan pada 2005, 2Q. Hadir dengan fitur: layar 3.0 inch TFT resistive touchscreen, GPS, Bluetooth. HP iPAQ hw6515 Windows Mobile smartphone. Diperkenalkan pada 2005, 2Q. Hadir dengan fitur: layar 3.0 inch TFT resistive touchscreen, 1.3 MP camera, GPS, Bluetooth. HP iPAQ hw6910 Windows Mobile smartphone. Diperkenalkan pada 2006, February. Hadir dengan fitur: TFT resistive touchscreen, Wi-Fi, GPS, Bluetooth. HP iPAQ hw6915 Windows Mobile smartphone. Diperkenalkan pada 2006, February. Hadir dengan fitur: TFT resistive touchscreen, 1.3 MP camera, Wi-Fi, GPS, Bluetooth. HP iPAQ rw6818 Windows Mobile smartphone. Diperkenalkan pada 2006, 2Q. Hadir dengan fitur: 2.7? TFT resistive touchscreen, 2 MP camera, Bluetooth. HP iPAQ 910c Windows Mobile smartphone. Diperkenalkan pada 2007, September. Hadir dengan fitur: 3G, 2.46? TFT resistive touchscreen, 3.15 MP camera, Wi-Fi, GPS, Bluetooth. HP iPAQ Data Messenger Windows Mobile smartphone. Diperkenalkan pada 2008, October. Hadir dengan fitur: 3G, 2.81? TFT resistive touchscreen, 3.15 MP camera, Wi-Fi, GPS, Bluetooth. HP iPAQ Voice Messenger Windows Mobile smartphone. Diperkenalkan pada 2008, October. Hadir dengan fitur: 3G, layar 2.4inch TFT display, 3.15 MP camera, Wi-Fi, GPS, Bluetooth. HP iPAQ Glisten Windows Mobile smartphone. Diperkenalkan pada 2009, November. Hadir dengan fitur: 3G, 2.5inch AMOLED resistive touchscreen, 3.15 MP camera, Wi-Fi, GPS, Bluetooth. HP TouchPad tablet. Diperkenalkan pada 2011, February. Hadir dengan fitur: 9.7? LED-backlit LCD display, 1.3 MP camera, Wi-Fi, Bluetooth. HP Pre 3 smartphone. Diperkenalkan pada 2011, February. Hadir dengan fitur: 3G, 3.58? TFT capacitive touchscreen, 5 MP camera, Wi-Fi, GPS, Bluetooth. 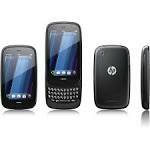 HP Pre 3 CDMA smartphone. Diperkenalkan pada 2011, February. Hadir dengan fitur: 3G, 3.58? TFT capacitive touchscreen, 5 MP camera, Wi-Fi, GPS, Bluetooth. HP Veer smartphone. Diperkenalkan pada 2011, February. Hadir dengan fitur: 3G, layar 2.6inch TFT capacitive touchscreen, 5 MP camera, Wi-Fi, GPS, Bluetooth. HP Veer 4G smartphone. Diperkenalkan pada 2011, May. Hadir dengan fitur: 3G, layar 2.6inch TFT capacitive touchscreen, 5 MP camera, Wi-Fi, GPS, Bluetooth. HP TouchPad 4G tablet. Diperkenalkan pada 2011, July. Hadir dengan fitur: 3G, 9.7? LED-backlit LCD display, 1.3 MP camera, Wi-Fi, GPS, Bluetooth.